Happy Anniversary, Jenn at You know...that Blog? Awwwhhhh... thanks doll! 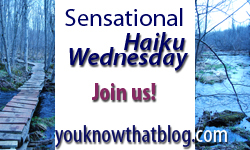 Was great to see you join us this week :) I love our weekly haiku - hard to believe it's been going strong for 100 weeks without a miss! Hope you join us again next week ;) --Cheers! Oooooh great haiku! It is so creative! Years of solitude .. very good!